As everyone surely knows by now, today would have been Johnny Cash's 81st birthday, and he's been rightly celebrated all around the internet for his one-of-a-kind country persona as "The Man in Black." Cash was so well-loved in part because, like only a handful of other country stars (Hank Williams, Patsy Cline, Dolly Parton, Emmylou Harris), he transcended the genre, winning fans from every conceivable corner. The outlaw singer was also no stranger to TV and film cameras, once hosting his own talk show and appearing in several dozen films and TV shows as himself. But did you know that Cash once had a starring feature film role alongside Vic Tayback and Ron Howard? 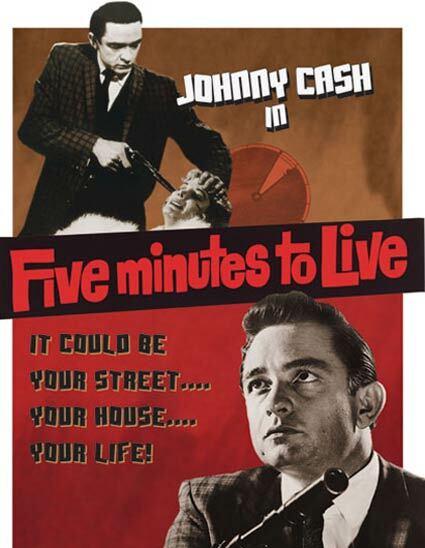 That's right, in the 1961 crime drama above, Five Minutes to Live, Cash plays Johnny Cabot, described by Rotten Tomatoes as "a bloodthirsty New Jersey gangster who is forced to hide out in a small California suburb after killing a cop during a job gone wrong." Cabot is a musical crook, who tricks his way into a bank president's home by convincing the president's wife he's a guitar salesman. Once inside, he terrorizes her and sings menacing songs in her direction. Ron Howard plays the victimized woman's son Bobby, and another country great, guitarist Merle Travis, has a small role as a bowling alley owner. It's all in keeping, I guess, with the Johnny Cash outlaw legend (though he may have regretted the lurid, grindhouse movie poster below). Five Minutes to Live was re-released in 1966 as Door-to-Door Maniac. Whatever you call it, you may hear more about this movie soon: Speed director Jan de Bont has been brought on to direct a remake in the near future. And yes, there's been talk (if only tongue-in-cheek) of casting Joaquin Phoenix in the Cash role. Five Minutes to Live is in the public domain, and we've added it to our collection of 500 Free Movies Online. In the opening credits, guitarist Merle Travis is listed as an actor as “Merle Travis,” but under the “Song” heading he is listed as “Solo guitar Merl Travis.” Editor fail! Fun way to spend 75 minutes.